Now you can cushion your product and eliminate the damage that static can cause in the shipping and storing of static-sensitive materials. 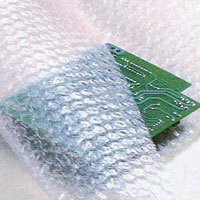 This heavy-duty anti-static bubble wrap film is perfect for long shipping cycles. Use it to wrap electronic or computer components. It comes in 12" perforated sheets in its own dispenser.